La Vie Parisienne is an operetta composed by Jacques Offenbach, with libretto by Henri Meilhac and Ludovic Halévy. The work was Offenbach’s first full-length piece to portray Parisian life and soon became one of his most popular operettas. It received its first London performance at the Holborn Theatre on 30th March 1872. 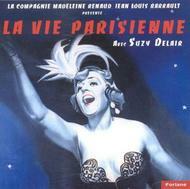 This recording features Suzy Delair, the iconic French actress and singer. Born in 1916, she became one of the most famous movie stars of the French cinema.